The victorious Chesterfield U18s' side, who are making waves at national level. A hat-trick from skipper Joe Morton helped Chesterfield U18s pull off a sensational upset to reach the semi-finals of the Tier 3 National Championships on Sunday. 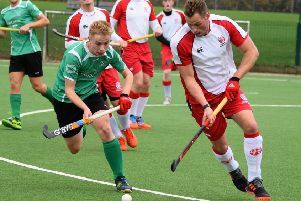 Having already beaten one club twice their size in Belper, they did it again by stunning West Bridgford 3-1, and won rich praise from coach Christian Battye. Bridgford took an early lead in the tie, but Chesterfield rallied and soon began to assert themselves, replying with two goals before half-time, in the 26th and 30th minutes. A thrilling match was settled when the inspirational Morton bagged his third goal five minutes into the second half, and the hosts were well on their way to another giantkilling act. The visitors threw everything they had at the rest of the match, but Chesterfield held on to reach the semis and dream of yet further glory. The tournament features teams from across the country, and the Chesterfield lads must now wait to see who they will be asked to take on in the semis, which will be held later in the season.